Investing in quartz countertops can do wonders for the look and feel of your entire home! 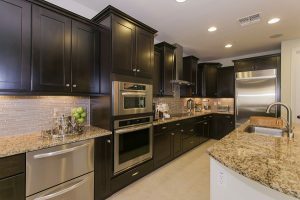 When it comes to choosing countertops for your home there are numerous considerations to make in regards to a vast range of materials. Your lifestyle, tastes, budget, goals for a room and more should all be considered. Are you looking for something that can withstand wear and tear or something that is more for the purpose of completing a room’s entire look and feel? What do you like and dislike? Are you trying to find something that fits into an existing color and design scheme? Let’s take a look at the popular quartz, a staple in home countertops. Quartz is popular for bathroom and kitchen remodels. It’s a high-quality material with a luxurious look and feel. Quartz in nonporous, which means that it does not stain or etch. This environmentally friendly option is also highly customizable. It is a popular option for those with specific tastes or a very strong and specific color scheme within their home. Aside from this, its aesthetic value is hard to match. These beautiful countertops are made from ground-up quartz, a binding resin, and dyeing elements. Manufacturers and suppliers offer customers a diverse range of colors, which mean that there is a quartz countertop to suit every taste. This is different from other countertop materials, such as granite or marble. These occur naturally which means that their color is often inconsistent. Homeowners with specific color needs can actually work with a manufacturer to get precisely the color of quartz they need for their countertop. However, this is not always necessary, as many companies offer over 80 colors from the start. This makes finding exactly what you need a snap. This entry was posted on Friday, May 12th, 2017 at 12:44 pm. Both comments and pings are currently closed.